Bernardino de la Trinidad González Rivadavia y Rivadavia (May 20, 1780 – September 2, 1845) was the first president of Argentina, then called the United Provinces of Rio de la Plata, from February 8, 1826 to July 7, 1827. Rivadavia was active in both the Argentine resistance to the British invasion of 1806 and in the May Revolution movement for Argentine Independence in 1810. In 1811, Rivadavia became the dominating member of the governing triumvirate as Secretary of the Treasury and Secretary of War. Until its fall in October 1812, this government focused on creating a strong central government, moderating relations with Spain, and organizing an army. By 1814 the Spanish King Ferdinand VII had returned to the throne and started the Absolutist Restauration, which had grave consequences for the governments in the Americas. Manuel Belgrano and Rivadavia were sent to Europe to seek support for the United Provinces from both Spain and Britain. They sought to promote the crowning of Francisco de Paula, son of Charles IV of Spain, as regent of the United Provinces, but in the end he refused to act against the interests of the King of Spain. The diplomatic mission was a failure, both in Spain and in Britain. He visited France as well, and returned to Buenos Aires in 1821, at their friends' request. 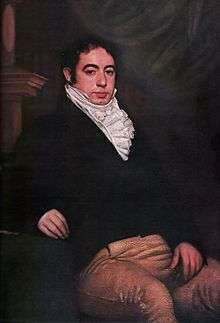 In June 1821, he was named minister of government to Buenos Aires by governor Martín Rodríguez. Over the next five years, he exerted a strong influence, and focused heavily on improving the city of Buenos Aires, often at the expense of greater Argentina. To make the former look more European, Rivadavia constructed large avenues, schools, paved and lighted streets. He founded the University of Buenos Aires, as well as the Theater, Geology, and Medicine Academies and the continent's first museum of natural science. His government had many problems, primarily an ongoing war with Brazil over territory in modern Uruguay and resistance from provincial authorities. Faced with the rising power of the Federalist Party and with several provinces in open revolt, Rivadavia submitted his resignation on June 29, 1827. He was succeeded by Vicente López y Planes. At first he returned to private life, but fled to exile in Europe in 1829.